A revolutionary tool is helping Dr. Goldstein detect and treat tooth decay earlier, when it can be almost impossible to detect with the naked eye. It’s called DIAGNOdent. With it, Dr. Goldstein is able to quickly and easily examine teeth for signs of decay where it can hide, along fissure lines or inside biting and chewing surfaces. 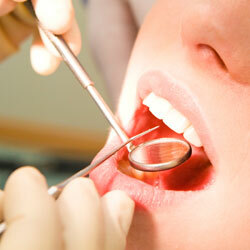 DIAGNOdent works by using a fluorescent light to compare the reflection wavelength of teeth against a healthy baseline. What this means for patients is simpler, shallower fillings that preserve more of the tooth’s natural structure. That’s what we call conservative dentistry. The aim of conservative dentistry is to help patients keep as much of their natural smile as possible, and for as long as possible. DIAGNOdent is a unique tool that’s helping Dr. Goldstein do that every day. If you’d like to find out more about how DIAGNOdent is helping us, call our Randolph dental office today to schedule a consultation with Dr. Goldstein. We serve patients from Randolph, Rockaway, Mendham, Chester, Morristown, Denville, Morris County, and beyond.